For years we’ve provided the most comprehensive customer service in the industry, and we’re dedicated to helping even more people find their way to better hearing. In an effort to better service, all of our customers are offered evening, weekend, and home appointments. We also offer 24-hour emergency contact with our Value Added, All-In Program. At Hometown Hearing Centre we honor all existing and previously purchased warranties. We believe that all our products and services should be of the best quality and best value. Ask about our guarantees where we commit to excellent customer service, not only for brand new purchases but for maintenance of all our devices. We want your good hearing to be for life! Contact us today for more information. Communication is critical in life. Your job and social interactions are more rewarding when you can communicate confidently – and hearing is vital to that. Deciding to wear hearing aids is a big step, no matter how long you’ve been living with hearing loss. That’s why Hometown Hearing Centre brings you the most sophisticated technology in a range of hearing solutions with price options to fit your budget, in order to make the transition as easy as possible for you. You may have heard hearing aids are hard to take care of. But that’s old news. We offer a range of accessories that make it easy for you to clean, dehumidify and even recharge your hearing aid batteries. Contact or visit us today to learn more. Improve Your Hearing, Improve Your Life! 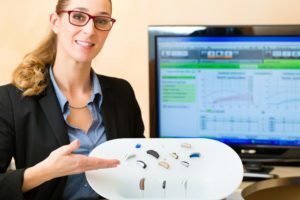 A study was completed and shows that Canadians between the age of 60 and 79 years old are more than 80% likely to experience some level of hearing loss. If you think you have hearing loss, or know a loved who does, our interactive tools are a good first step towards getting the help you need.